This year is the 50th anniversary of Woodstock. 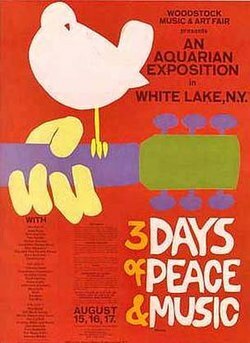 The idea of going to a music festival may not be as revolutionary as it was to those who trekked to Max Yasgur’s farm in upstate New York but it’s certainly nice that you won’t need supplies airlifted into your local aquarian exposition. But now that music festivals are de rigueur, how does one pick which fest to attend? We here at The Southern Weekend drew up a handy little cheat sheet for those who want to get their money’s worth by seeing five (or more!) bands in one day. You can pick by lineup, by location, or by any other methodology; just know you’ll probably see us out there too. These are all festivals happening in Spring and early Summer. We’ll be sure to update you in a few months for late summer and fall options. And check out our country festivals recommendations too. What is it: This one is the granddaddy of them all in the South. Bonnaroo has taken over Manchester, Tennessee, every June for nearly two decades. In recent years, they fest has scaled back on all-night jam sessions in favor of permanent, more comfortable infrastructure and more lively campgrounds. Whatever changes they’ve made, this is still the best place in the South to hangout with 80,000 of your closest friends and celebrate the summer solstice. Just make sure you’re ready to give strangers high five. You’re gonna give out a lot of high fives. Who’s playing: The Bonnaroo lineup this year likely has something for everyone. Legendary jam band Phish is playing three sets over two nights while plucky young upstart Post Malone takes over on Saturday. They round things out with a special appearance from the folks behind Nashville country music institution The Grand Ole Opry, and Atlanta-based rapper, actor, director, writer, all-around-genius Childish Gambino (aka Donald Glover). What is it: This is Bonnaroo for those of us who love hotel rooms. Set right in the middle of Atlanta, Shaky Knees has set the bar for great lineups in the South since their debut in 2013. This festival is expertly run. The schedule is organized so no more than three bands ever overlap with their set times. The festival grounds are laid out to spread crowds out effectively. And, here’s the best part, lines are short for food, water, and bathrooms. With so much fun stuff to do in Atlanta, we kinda think it’s weird you haven’t bought a ticket yet. Who’s playing: Don’t want to trek out to the Californian desert for Coachella this year? Well don’t worry, you can catch headliner Tame Impala at Shaky Knees about two weeks later. Then you can catch alt-rock weirdo and simultaneous pop music master Beck as well as English legends Tears for Fears and blues guitar shredder Gary Clark Jr.
Don’t miss: Jim James, Lucy Dacus, Liz Phair, Phosphorescent, Curtis Harding, Natalie Prass, Oh Sees, Idles, and Atlanta locals Deerhunter and Black Lips. Get ready to rock!! Who are you most excited to see at #ShakyKnees? What is it: OK, we lied, THIS is the granddaddy of them all. This New Orleans has celebrated everything we love about New Orleans for half a century and they don’t show any signs of slowing down. This is a great alternative for those who maybe can’t hang at camping festivals anymore. It’s conveniently placed at the Fair Grounds Race Course, folding chairs and coolers are allowed, the food vendors are some of the best you’ll ever find at a music festival, and one of the highlights of the fest—the gospel tent—even has folding chairs and a misting system. The outdoor shows end at 7 p.m. every evening but don’t worry though, there are literally dozens of late-night shows across the city each of the two weekends. This festival is a can’t miss for those who love the South. Who’s playing: Dave Matthews Band, Katy Perry, Jimmy Buffet, Christ Stapleton, Bob Seger, Santana, Pitbull, Van Morrison, Al Green. I mean COME ON. Only New Orleans could handle that much talent in one city. And that’s all before you mention the jazz and soul legends like Trombone Shorty, Gladys Knight, Herbie Hancock, Irma Thomas, Mavis Staples, and many, many others. Don’t miss: Really you should just walk around town and pop into whatever late night set sounds good. But if you want some guidance we say go for Kamasi Washington, Big Freedia, Galactic, Taj Mahal, karl Denson, Kermit Ruffins, Rebirth Brass Band, J Balvin, Hurray For The Riff Raff, and Leon Bridges. Dates: April 25-28 and May 2-5. Be careful here, artists only play one weekend of the fest and tickets are sold by day. What is it: South By Southwest (aka SXSW) is a one-stop shop for music, film, comedy, video games, and bright ideas. The music festival specifically takes over Austin each March to give thousands of artists from dozens of countries the chance to get their big break. This is the home of legendary performances like The Stooges playing their first set with James Williamson in 40 years, Amy Winehouse playing her first EVER U.S. show in 2007, and a three-hour, half-dozen encore performance from Prince in 2013. Before you head down there, make sure you have way to stay cool and keep your phone charged because the long lines are just as famous as the performances here. But when you’re seeing Tyler, The Creator rap while hanging from the rafters, who cares how long the line was? Who’s playing: Everyone. Literally everyone will be there. The 2019 lineup has more than 2,000 performers. Some can’t miss acts include Bedouine, Kamaal Williams, K Camp, Pablo Trujillo, The Beths, Sneaks, Summer Cannibals, DJ Paypal, illuminati hotties, Yung Lean, Ratboys, Lunar Vacation, and Lee Bains III & The Glory Fires. When: The music showcase takes place March 11 – 17 but there are SXSW events in Austin starting on March 8th. What is it: This one is kind of like SXSW but there’s a greater focus on barbecue. Beale Street Music Fest is part of the Memphis in May Festival, an month-long event where the entire city (and some visitors) come together to celebrate all the great stuff Memphis has to offer. There’s a huge barbecue competition, a half-marathon and 5k, the music festival, and a whole lot of other events to check out. There’s no lineup out yet but we have some ideas of what to do when you visit Memphis. When: The music fest kicks things off May 3-5 and the rest of the party lasts through May 25th. What is it: Remember that time Robert Johnson sold soul to the devil in exchange for a mastery of the guitar and then he invented the blues (allegedly)? That happened at a crossroads near Dockery, Mississippi, on the Sunflower River. The Sunflower Festival is held just up the river in Clarksdale, itself home to blues and rock legends like Muddy Waters, Son House, Sam Cooke, Ike Turner, as well as rappers Nate Dogg, and Rick Ross. What we’re saying is there’s a lot of talented people in Clarksdale and you can see them all at Sunflower Fest. The best part? This fest is always free. Who’s playing: the lineup won’t be released until later in the summer but it’s always populated with local heroes and delta blues legends so we say go ahead pack up your car for this one. When: It’s usually held the third weekend of August but official dates have not been announced yet. What is it: Who says you need to risk a sunburn to attend a music festival? Big Ears trades the dirt field for the theaters and churches of Knoxville and we couldn’t be more excited about it. Big Ears focuses on classical, jazz, and experimental sounds and they consistently bring in acts you can’t see anywhere else in the South. Not to mention they encourage collaborations among artists that probably won’t ever happen again. So if an all-night Bonnaroo rager sounds a like a little too much these days, maybe check out this festival where most of the venues are seated. Who’s playing: Fabled free jazz trumpet player Wadada Leo Smith has two sets here—one solo and one with friends Bobby Naughton and Dwight Andrews where they’ll pay tribute to their classic album “Divine Love.” Other artists include banjo virtuoso Bela Fleck with prodigious Colombian harpist Edmar Castañeda, experimental pianist Nils Frahm, and up-and-coming jazz drummer Makaya McCraven. Don’t miss: Sons of Kemet, Jlin, This Is Not The Heat, Mountain Man, serpentwithfeet, Spiritualized, The Art Ensemble of Chicago, and Vijay Iyer and Craig Taborn. Jaga Jazzist have evolved their kaleidoscopic take on the genre through instrumental diversity and a mind-bendingly broad range of styles and influences over the last two dozen years. Fans of the Norwegian phenomenon will be treated two performances at #BigEarsKnox — a solo set and a collaborative set featuring Stale Storlokken and Jon Balke.